Take dropping off and picking up the cleaning off your to-do list! Now you can have us come to you… at no extra charge. 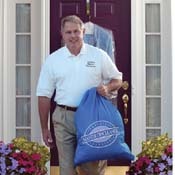 Mill Plain Cleaners features FREE pickup and delivery of your dry cleaning and no minimum order or monthly fees! Turning that list into a closet of fresh, clean clothes has never been easier or more convenient. Whether you are a busy professional or a parent on-the-go (or both!) 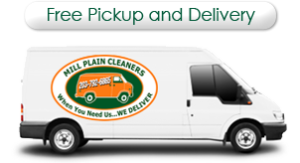 you will benefit from the services of Mill Plain Cleaners. In addition to high-quality home and office dry cleaning delivery, we also provide alterations and tailoring, leather and suede cleaning, shoe repair, wedding gown preservation, comforter laundering, and household item cleaning. It’s the ultimate in service and convenience. You will love it! Fill out the form below and we will contact you with your service days based on our routes. We come to you twice a week. Items we pick up the first day, we return the next delivery day. Your location will determine your pick-up and drop-off days. This could be Monday and Thursday for example. You can always drop off at the store or pick it up there if you wish. There are no obligations, minimums or special requirements. Questions? Give us a call at 203-792-6865 for details. Please fill in the form below and click on the Submit button. We will call you directly.